A spoken word can have lasting effects, because when it is released into someone’s life it can either build them up or tear them down. Therefore,before we speak, we should always take the time to consider our words as valuable and use them skillfully. If we do this, our words will sound beautiful,and be treasured. If our words are chosen carefully, and spoken at just the right time, they could be used to change someone’s life for the better. 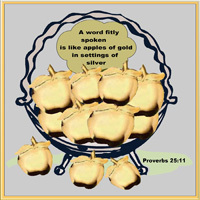 Today: Imagine a beautiful silver bowl full of golden apples, then choose to speak words that will reflect that image to others.